Third album from this very special band which I’ve been following since its very beginning and perhaps their best endeavour so far. It’s a given fact that the contemporary Greek metal scene has some real gems, some bands that really stand out and this statement spans throughout the whole metal spectrum. 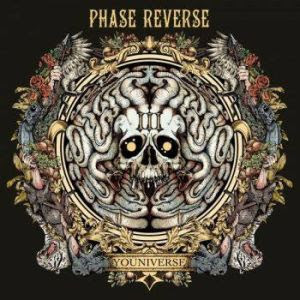 PHASE REVERSE is a unique and fine example of how Southern rock/metal should sound and with “Phase III Youniverse” they’ve managed to create their own universe of sounds that has the best elements of this catchy genre, but given through the band’s personal perspective. So, here you’ll have the chance to enjoy groovy parts, a solid rhythm section, heavy guitars and killer vocals that reminded me a bit of Zakk Wylde. PHASE REVERSE is a band that addresses to fans of bands like BLACK LABEL SOCIETY, MOTORJESUS, BRAND NEW SIN, THE NEW BLACK and the likes. I don’t think there’s much more to be said here… the album is amazing and it has a couple of songs where the band marries traditional Greek music with southern rock and the end result is breathtaking. The production is also another plus since it has the necessary volume and power and the digipak is beautiful and worked in every detail. The fans of southern rock/metal shouldn’t hesitate a second. Grab a copy, some beer and enjoy or get in the car and start speeding! Αναρτήθηκε από Nick Parastatidis στις 5:37 μ.μ.